I love my slow cooker in the fall and winter for all sorts of soups and stews. The problem is that most recipes call for shorter cooking times of 4-6 hours and I am gone for my work day for 10 hours most days. I need recipes that I can prep ahead of time and throw in the slow cooker in the morning. 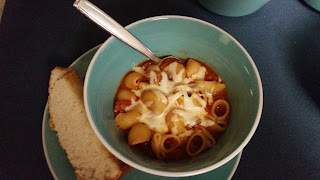 Inspired by plenty of Facebook and Pinterest posts about freezer to slow cooker meals, I set out this week to build a collection of Aldi-friendly (standard Aldi ingredients only) that work for freezer to slow cooker. In 90 minutes I was able to prep 10 main courses that went straight to the freezer ready to be pulled out any given morning and thrown into the slow cooker. The research, organizing, and shopping time were substantially more but since I am nice person, I will share my shopping list and meal plan. If you want to double any of the recipes you will really increase your meal count without a lot of extra work. Just bag two meals at a time! This recipe was a hit on a freezing Kansas day! I have heard about slow cooker lasagna soup, but there's something about heat and a wonderful smell coming from my kitchen on such a cold day! Of course if I were to make this during the week I would put all the ingredients except the pasta in the slow cooker on low and then add the noodles in the evening! This will definitely become a repeat menu item for my family! 1. Brown ground beef, drain if necessary. 2. I also cooked the onions and garlic towards the end of the beef being fully cooked. 3. Add the rest of the ingredients, stir over medium heat. 4. Reduce heat to a simmer for about an hour. This has become my "Go To" appetizer recipe for any and all parties that we attend, even those last minute invites! 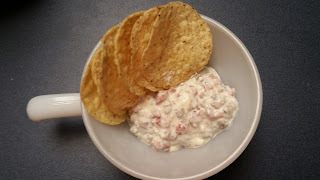 Lots of things about this appetizer make it my favorite, but most of all is that with the chips included it's right at $10 and oh so easy! I'm sure many have heard it referred to as 1,2,3 dip or 3, 2, 1 dip. I like to call it 3, 2, 1 Dip because that's the order I place the ingredients in the slow cooker. I'm posting this one tonight because we have football on right now and are headed over to a party to watch basketball! Gotta love winter sports and comfort food! Inspired by the Simple Whole Wheat Bread recipe, I worked and tweaked to get a 100% whole wheat bread that was still soft enough to use for sandwich bread. I finally got brave enough to try bread without my bread machine and I am finally getting it down. Yields 3 loaves so you will need 3 bread pans. Ingredients3 c. warm water (about 110*)2 packages rapid rise yeast (you could use regular as well but I don't have as good of luck with rising with that)2/3 c. honey (divided 1/3 and 1/3)9-11 c. whole wheat flour (5c and 2c. and about 2c. more when kneading)5 T. butter melted (divided 3T and 2T)1 T. salt Directions 1. In a big bowl mix 3 c. warm water, 2 packages of yeast, 1/3 c. of honey, and 5 c. sifted whole wheat flour. Mix until combined and then set aside for 30 minutes to rise. I like to place it in my microwave to help make sure there are no drafts. This is my kiddos favorite thing to drink in the morning! 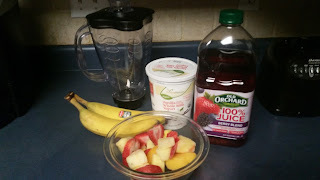 I like it because they are getting more than a serving of fruit, and I'm not just serving them an entire glass of juice along with their breakfast because I only use about one cup of juice for the entire pitcher which serves both my kiddos and I even have a little left for me! Place all ingredients in the blender and blend away! I like to serve these in the canning jars with the Ball lids and straws because the straws are larger. I have used the flavored yogurts as well, but I prefer the Organic Whole Milk Yogurt when Aldi has it on hand. I also tend to use whatever juice I have open or prepared in a pitcher at the time, orange juice happens to be my favorite. Ingredients2 crowns of broccoli -steamed and trimmed into bite size pieces4 T. butter4 T. flour1 block of cream cheese8 oz. of sharp cheddar, shredded1 c. to 12 oz. of pilsner-style beer (or chicken/veg. stock as a substitute) Directions 1. Trim broccoli and steam in microwave or stove top until fork tender. I like the microwave method. I add the broccoli and about 1/4 c. water to a microwave-safe dish and microwave for 2 min. increments over and over until fork tender. 2. In a large sauce pan or stock pot melt butter on med-low heat. Then add flour to butter to make a paste. 3. Next melt cream cheese into the flour-butter (roux). Then melt the cheddar cheese into the sauce. You will be doing a lot of stirring! 4. Next add the beer or stock and keep stirring until well incorporated. A full 12 oz. of beer will yield a very yeasty tasting soup (YUM! ), if that's not your thing back it off to a cup of beer or use stock. © Katie Flott and Carolyn Gonzales, 2014.